This Lloyd Bacon (It Happens Every Spring) picture doesn't waste any time getting started. A Merchant Marine ship carrying fuel for overseas troops is attacked by a German submarine. 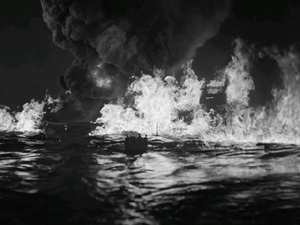 Jumping through fire and dodging explosions, the men of the ship make their way to the lifeboats. Led by Captain Jarvis (Raymond Massey, Arsenic & Old Lace) and Lt. Joe Rossi (Humphrey Bogart, In a Lonely Place [review]), most of them get out alive. As their ship sinks and the ocean burns, the U-Boat turns on them, destroying their lifeboat and forcing them to float on a bare raft for a week and a half. That's a long time to think about getting your vengeance. The survivors aren't back on dry land very long before they receive a new assignment. Only one of them, Pulaski (Dane Clark, Destination Tokyo), even thinks of staying home, but once the other guys get through browbeating him, he gladly accepts his duty. It's up to the Merchant Marines to make sure the rest of the fighting forces get their weapons, so if guys like Pulaski pull out, who will take care of business? The crew's new cruiser, The Sea Witch, is loaded up with planes and other equipment, and they now also have a Navy gunner crew to provide protection. The freighter joins an international convoy of ships on their way to Russia for added muscle, but the journey will be fraught with peril and eventually the Witch will be on its own, squaring off with a Nazi U-boat so the old crew can exact its revenge for their lost mates. Action in the North Atlantic has two major things going for it. The first is the camaraderie of the men. Scenes down below deck between the sailors provide moments of lightness. The crew plays cards and ribs one another. Alan Hale, known for his regular roles as Errol Flyn's sidekick, is particularly funny as Boats, a womanizer who goes to sea to escape his alimony payments. 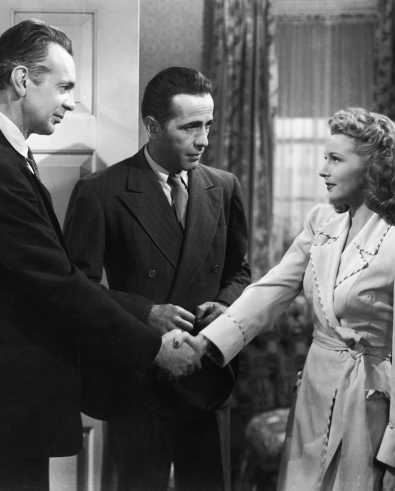 Bogart is the definite star, however. In what is his usual turn, Rossi begins the picture as a man who is only in it for himself. Yet, after the tragedy, he ends up marrying a pretty saloon singer (Julie Bishop, Northern Pursuit) and realigning his priorities. Though he insists he doesn't ever want to captain his own ship, as he is not fond of responsibility, viewers will know right away exactly what is going to happen to Joe: he's going to prove he has more mettle than he gave himself credit for. The second major attribute of Action in the North Atlantic is the battle scenes. Special effects shots are spliced together with documentary footage of real boats and planes. Though I'm sure some models were used, Bacon has shot the movie so that it's not obvious what is real and what is not. 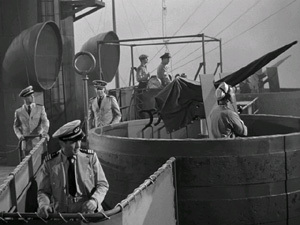 The action is exciting, and some of the death scenes, particularly down in the submarines, are harrowing. The tension and danger of the fighting makes the rush to Russia all the more electrifying.